On March 12th of this year Google released a new algorithm update and in decidedly creative form have named it the “March 2019 Core Update”. Incredible. The usual flurry of speculation is still in full force as SEOs attempt to piece together who is going to be impacted by this update and why, while help from Google towards putting the pieces together has remained minimal. Following is a quick update on what people are saying about the update, some history to help put it in context, and what you should be doing to make sure you aren’t hit. To help put this latest update in perspective, let’s step back and visit Google’s last major algorithm change, the “Medic” update. This core update got its name by having the most noticeable effect on websites relating to health, wellness, fitness, and medicine. In addition to sites featuring info on medical/health topics, many e-commerce sites were also impacted, largely those within the health and wellness sector. What Are People Saying About the March 2019 Update? A central theme of much of the chatter in the SEO community about what the March 2019 update is geared towards comes back to the user. Most theories are based on Google removing an emphasis on showing pages that are actually valuable to a user (e.g. a heavily research, lengthy, and hard to digest article on cholesterol) towards showing pages that the user will perceive as valuable (e.g. “Buzzfeed’s 10 Quirkiest Ways to Lower Your Cholesterol”). Whether or not this is true is up for debate. Other theories put forth the idea that the update has deemphasized the power of links, in favor of brand recognition. In other words, Google is now serving people websites that they recognize rather than serving them websites that have received the highest quality of links from other websites, as has been done in the past. This theory however has been largely discredited. Alternatively, some thinking is around click metrics, specifically bounce rate, though these have also been dismissed. Google’s take: have great content. 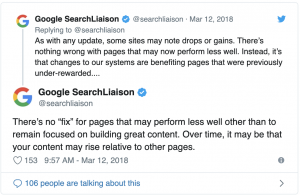 For both the Medic update and the March 2019 update, Google asserts that they aren’t penalizing websites for doing anything wrong, but they are rewarding well-made content that hasn’t been fairly represented in search results in the past, which explains the dip in previously high performing pages (more competition). To hear it from Google, don’t worry, just keep making great content and you will be rewarded in search results. Mockingbird’s take: have great content. At the end of the day, the best SEO strategy does boil down to content. You can spend months focussing on optimizing a site to show up in search but if the content isn’t there, there’s nothing to prop up. After looking at myriad law firm websites, without fail the sites that have the most traffic (and typically the most leads) have a foundation of great content.